The character and style of North Carolina's Protestantism was primarily evangelical. Evangelical faith emphasized biblical authority, commitment to proselytizing, sympathy for revivals, suspicion of liturgical formalism (such as in Roman Catholicism), and a subjective assurance of personal conversion-having been "born again" in Christ. Most Christian groups adhered to these beliefs, although some Quakers and Moravians, and a few Baptists, Presbyterians, Lutherans, and Episcopalians, resisted. Each denomination of Christians created periodicals, schools, colleges, and networks of churches, so that by the Civil War, although there were different kinds of Protestants, evangelical values dominated formal as well as informal religion and exercised considerable cultural influence beyond the churches. In the 1750s, as the religious fervor of the First Great Awakening swept through the colonies, ministers came to North Carolina hoping to ignite stronger Christian faith among the people. These preachers, mostly Presbyterians and Baptists, started a number of churches in the Coastal Plain and the Piedmont. This revival movement declined in the years just before and during the Revolution. The spark, however, was kept alive by isolated groups of Moravians, Quakers, Lutherans, and others. But the war ended any influence that the Church of England might have had, for in 1817 its successor, the Episcopal Church, was established, although it did not get its first bishop until 1823. The Second Great Awakening-a revival movement featuring large outdoor meetings, fiery preaching, singing, and confession of personal sin-came to the state around 1800. Soon the churches were displaying their interest in the area of education by opening church-sponsored colleges, such as Wake Forest College begun by the Baptists (1834), Davidson by the Presbyterians (1837), Trinity (later Duke University) by the Methodists (1839), and New Garden (later Guilford College) by the Quakers (1837). The latter was the only one of these schools that from the start educated men and women together. The education of women was, however, of special concern to several churches. The Methodists established Greensboro Female College (later Greensboro College) in 1838; Episcopalians established Saint Mary's in Raleigh in 1842; and the Baptists started Chowan Baptist Female Institute (now Chowan College) in Murfreesboro in 1848. Some denominations established hospitals during this era, to which Duke University Hospital (Methodist) and North Carolina Baptist Hospitals at Winston-Salem date their origins. Evangelical Christianity was complex in North Carolina, affecting people differently according to their race, class, and gender. A key element was the undeniable democratic effect the spread of evangelical Calvinism (mostly among Baptists but among a few remarkable Presbyterians as well) and Anglicanism (Methodism) had on North Carolina society-not in making elites soften their sense of entitlement but in encouraging those without rank to think of themselves as important and precious to God. The proof of this was a sensible experience of the presence of God in worship and interpreting the promises of the Bible under the rubric that "God was no respecter of persons." Women, especially among Methodists, and African Americans, together with relatively powerless white men, believed, through evangelical doctrine, that they were as valuable to God as were white male elites. For a generation or two after the American Revolution, this democratic leaven encouraged black preachers and a few religious virtuosi among women to strengthen the communal life of African American communities and the bonds of womanhood. Between the Revolution and the 1820s, some religious activists-especially under the influence of radical republicanism and Quakers-toyed with opposing African slavery; but the institution was too entrenched, and the traditional elites were too covetous of their privileges to surrender them easily. The issue of slavery led to deep schisms among Protestant churches. The three major denominations fell out with their northern colleagues and acted to form separate regional denominations. The Methodist Episcopal Church, South was organized in 1845. The next year saw the birth of the Southern Baptist Convention. The Presbyterian Church in the United States came into formal existence in 1864-65 after three decades of strained relations with northern Presbyterians. North Carolina's white elites soon discovered that evangelical Protestantism could be more supportive of traditional power structures than subversive of them. As elite men converted to evangelical Christianity, they found that neither the Bible nor the Holy Spirit that settled on revived communities demanded gender or racial democracy. Being reborn in Christ and conversant with the scriptures could make white men as convinced of their rectitude as were their dependents and slaves. Confederates could come to terms with their defeat in the Civil War through interpreting their suffering as similar to that of Christian martyrs and their Lord before them; their "Lost Cause" could be sanctified through hope strengthened by the Christian doctrine of Resurrection. African Americans, who saw their own suffering transformed through the biblical Jubilee of emancipation, could celebrate their vindication by God's "terrible swift sword" but be forced by suffering under white supremacy and segregation (supported by evangelical whites) once again to "wait upon the Lord." During the antebellum years in North Carolina, blacks and whites had often worshipped as one body in a white church. After the war was over, northern-based black denominations began to prosper in the South, including the African Methodist Episcopal Zion Church (founded in 1801), the African Methodist Episcopal Church (founded in 1816), and the Colored (now Christian) Methodist Episcopal Church (founded in 1870). 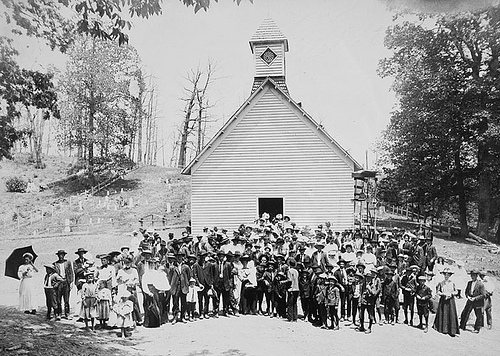 Pisgah church May 30, 1909 Frank W. Bicknell Photograph Collection, PhC.8, North Carolina State Archives, Raleigh, NC. Call #: PhC8_185. Available from http://www.flickr.com/photos/north-carolina-state-archives/2744934710/ (accessed June 11, 2012). 1 January 2006 | Mathews, Donald G.